Emblematic of Mido’s watchmaking expertise, the Multifort collection is welcoming a new model that combines timeless design and technological innovation. The Multifort Caliber 80 Chronometer embodies a dialogue between past and present, borrowing its classic forms from a historic 1940 model. It is equipped with a new automatic movement that ensures exceptional autonomy: the power reserve lasts up to 80 hours. Certified by the Contrôle Officiel Suisse des Chronomètres (the official Swiss chronometer testing institute), the Caliber 80 makes this model an instrument of extreme precision. The silver dial of this Multifort Caliber 80 Chronometer model is decorated with vertical Geneva stripes recalling the slender forms of Sydney Harbour Bridge, a manifesto of architectural modernity created in the 1930s. 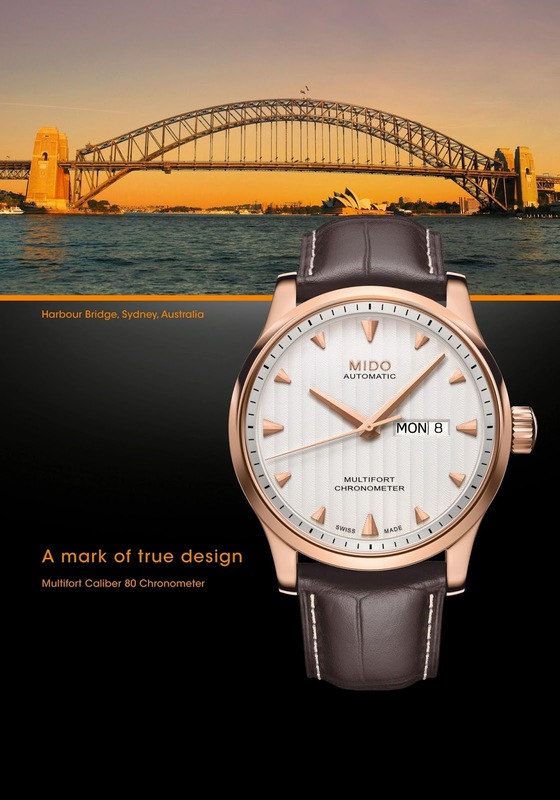 Launched in 1934, two years after the Sydney Harbour Bridge was completed, the Multifort collection shares the structure’s remarkable qualities – a perfect blend of functionality and beauty. A truth that has stood the test of time, as Mido celebrated the 80th anniversary of Multifort production in 2014, making it one of the longest-produced series in the history of Swiss watchmaking. The Multifort Caliber 80 Chronometer unites past and present. If this new model takes its design codes from the historic 1940 Multifort timepiece, its automatic movement – developed in accordance with Mido’s high standards – resolutely reflects the 21st century. It is endowed with the finest example of watchmaking innovation, the Caliber 80, exclusive to the Swatch Group, which ensures up to 80 hours of power reserve. This exceptional autonomy is combined with extreme precision, as the movement is certified by the Contrôle Officiel Suisse des Chronomètres. Beyond these technical features that will appeal to all fine watchmaking enthusiasts, the Multifort Caliber 80 Chronometer is distinguished by the understated elegance of its classic design, conceived to withstand the effects of time. Its rose PVD-treated steel case, with a diameter of 42 mm, houses a silver dial decorated with vertical Geneva stripes and protected by a sapphire crystal. The dial makes subtle reference to the suspension and rivets of the Sydney Harbour Bridge, an early 1930s symbol of architectural modernism. The faceted, polished and satinated indexes adorning the edge of the dial are golden-rose, and the day and date are displayed in an aperture at 3 o’clock. The Multifort Caliber 80 Chronometer is fitted with a transparent case back through which its automatic chronometer movement, finely decorated with blued screws, can be admired along with an oscillating weight decorated with Geneva stripes and the Mido logo. Water-resistant up to a pressure of 10 bar (100 m / 330 ft), this model comes with a genuine brown calf leather strap fitted with a folding clasp in rose PVD-treated stainless steel. Three other versions of the Multifort Caliber 80 Chronometer are also available. 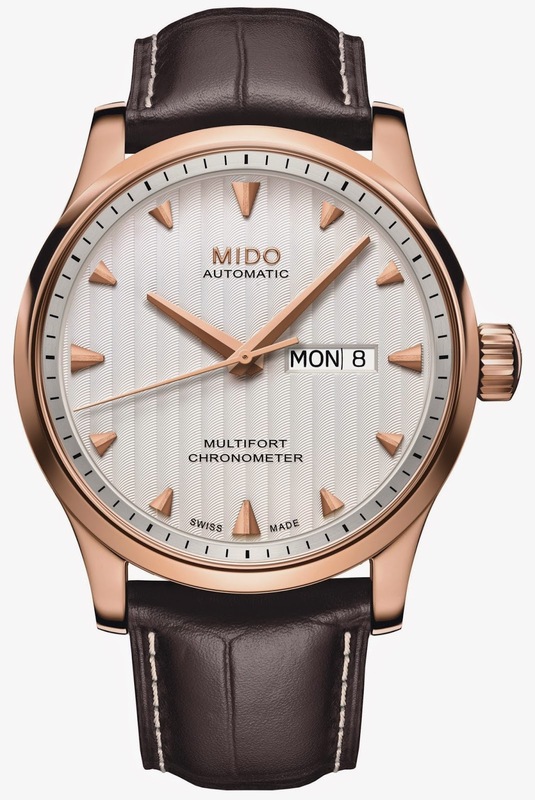 Automatic Mido Caliber 80 (ETA C07.621 base) COSC certified chronometer, 11½’’’, Ø25.60 mm, height: 5.22 mm, 25 jewels, 21,600 A/H, NIVACHOC shock-absorber, NIVAFLEX NM mainspring, ELINCHRON II balance-spring. Finely decorated chronometer movement with blued screws, decorated oscillating weight with Geneva stripes and engraved Mido logo, functions HMSD+Day. Adjusted on 5 different positions for a high accuracy. Up to 80 hours of power reserve. Stainless steel 316L with rose PVD treatment, Ø42 mm, 3 pieces, sapphire crystal, screwed crown and case back, transparent case back to see the finely decorated and chronometer movement, engraved serial number, water-resistant up to a pressure of 10 bar (100 m / 330 ft). Silver, vertical Geneva stripes, faceted satinated/polished indexes individually applied, day and date at 3 o’clock. Brown genuine calf leather strap with crocodile look and stainless steel folding clasp with rose PVD treatment.